Partisan gerrymandering — incumbents drawing legislative districts to keep control of legislative bodies — destroys democracy by assuring that majorities don’t rule. It has been described as elected officials choosing their voters, instead of their voters choosing their representatives. At the national, state and local levels our governments are made undemocratic by gerrymandering; despite widespread protest, those in power in both major parties keep doing it so that they can stay in power. Repeated efforts to get the U.S. Supreme Court to undo this practice have failed, though surely it is unconstitutional. What most people in Ulster County may not know is that we are among the handful of places in the country that doesn’t have this problem. That’s because our county charter gives us a process for neutral non-partisan legislative redistricting. And it has worked. The districts for the current, closely divided county legislature were drawn through this non-partisan process. But in doing this the first time around we found out that there were some flaws in our design, and we needed to take further steps to be sure that it was more inclusive and effective while remaining non-partisan. 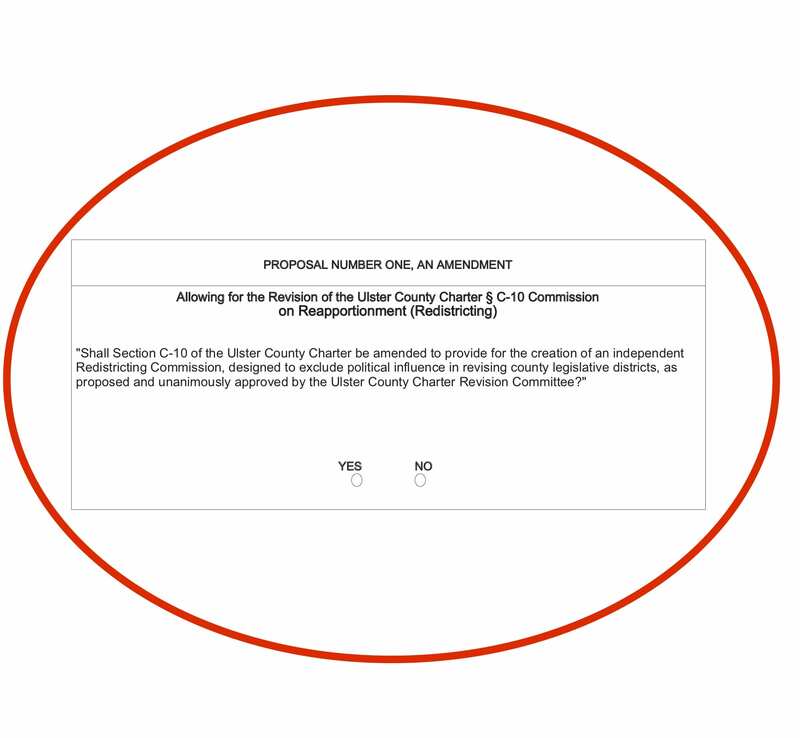 We assured that a sufficiently larger group of citizens not connected to the major political parties would comprise the pool of potential people chosen in a non-partisan manner to redistrict our county legislature every ten years. The results of our unanimously approved work can be found here. Our country is bitterly divided. It is a frightening time. We will shortly vote to determine the leaders of our nation and of our state. Without exaggeration, our futures and those of our children and grandchildren are at stake. So this important local matter may be overlooked. When you go to vote in this momentous year I ask you to keep in mind former Democratic Speaker of the House Tip O’Neill’s famous aphorism: “All democracy is local.” My commission colleagues and I fear that in our focus on national and statewide matters many of our Ulster County neighbors will forget that this crucial anti-gerrymandering, pro-democracy charter revision referendum is on the second page of the ballot (we’ve inserted a sample of the second page of the ballot here, so you can see what this amendment will look like with your own eyes). Don’t miss the chance to assure greater local democracy by keeping gerrymandering impossible in Ulster County.